Banks’ post-Fed boost has a temporary feel to it. The historic quarter-point rate rise announced by Federal Reserve Chair Janet Yellen sent the primary index of European bank shares up 3 percent on the morning of Dec. 17, with emerging markets-focused Standard Chartered up twice as much. In the medium term, the clouds outweigh the rays of sunshine. Insofar as the Fed’s move signals the start of a normalisation of rates, it is a positive for banks that have spent the best part of a decade subsisting on punishingly low asset yields. In general, banks will be able to charge customers more, and deposit-heavy lenders like HSBC will be able to make more money on their safest funding streams. Still, the good vibes among European banks are just as likely caused by Yellen’s aspiration that any further rate rises in 2016 and beyond will be gradual. That itself signals that higher rate rises carry potential negatives. The obvious one is that banks globally have advanced $9.8 trillion of dollar-denominated loans to non-banks outside the United States, with about one-third of these to emerging market economies, according to the Bank for International Settlements. Just over $2 trillion is cross-border debt extended by overseas sources, with over $100 billion granted to Turkish and Chinese borrowers apiece, and a similar amount by Russian banks to domestic creditors. A quarter-point rate rise is unlikely to send these borrowers into default, but further hikes might, if they make dollars relatively more expensive vis-à-vis local currencies. The other problem for European banks specifically is that their own rates aren’t going up anytime soon. With euro zone inflation currently forecast at 1 percent next year, the European Central Bank recently cut its deposit rate further and extended its bond-buying. Hence any dollar-denominated credit losses may not be ameliorated by improved net interest income. In extremis, the different trajectories of central banks could exacerbate the disparity in capital strength between American and European lenders. European bankers may still prefer that to an alternative scenario, where Yellen misjudges the U.S. recovery and is forced to cut rates, as Europe itself did in 2011. Either way, the future isn’t exactly bright. 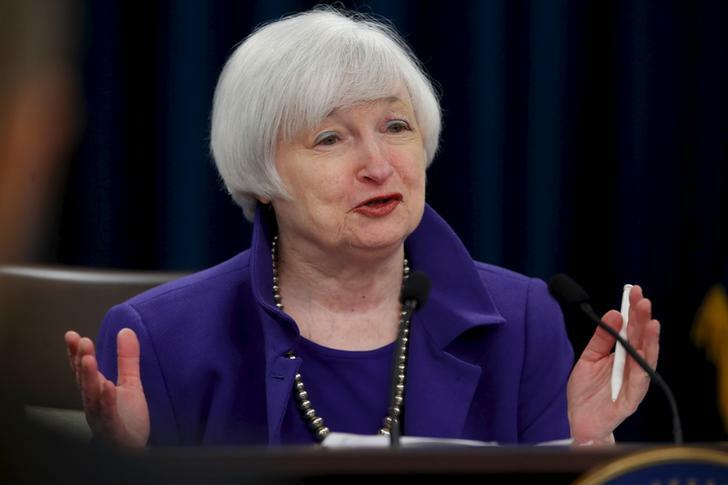 U.S. Federal Reserve Chairman Janet Yellen holds a news conference to announce raised interest rates in Washington December 16, 2015. Europe’s bank shares rose 2.9 percent on the morning of Dec. 17, following a quarter-point increase in rates by the Federal Reserve on Dec. 16. Standard Chartered was the biggest riser, jumping 6.7 percent to 547 pence. Natixis and National Bank of Greece rose more than 4 percent and Societe Generale, Commerzbank and Santander all rose more than 3 percent. As of 1000 GMT, the euro was trading at 1.0855 against the U.S. dollar, compared to 1.0911 on Dec. 16.